Below are our current listings for Grand Haven rentals. As you'll see, we feature a very nice mixture of full-size homes, cabins and resorts on or near the Lake Michigan shore, all in the Grand Haven, Michigan area. Enjoy! 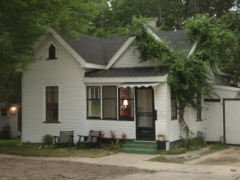 This charming cottage is perfectly located between the beach and downtown Grand Haven. Only 1 ½ blocks to the boardwalk, 2 blocks to town and ½ mile to the beach makes everything Grand Haven has to offer within walking distance!! Newly renovated, this 2 bedroom home sleeps 8 including the 2 available cots. Relax after a day at the beach in our fully shaded courtyard that features a brick patio, comfortable seating, a charcoal grill and a hammock for that afternoon nap. Amenities include: a fully furnished kitchen, washer and dryer, dishwasher, microwave, tv/dvd player, all sheets, quilts and pillows, board games and 2 bikes. Please visit our website for more pictures and information: www.harbortownproperties.com Or contact Brenda at 616-874-5297; 616-340-9256(cell) Please contact the owner for prices and availability. No smoking, Winter Rental available. This newly renovated 3 bedroom home is just minutes to the boardwalk, where you can enjoy shopping, miniature golf, the musical fountain, the marina, ice cream and much more. A day at the beach is just a short bike ride away, or simply hope on the trolley at Chinook Pier, where you will be dropped off right at the State Park entrance. This home includes sleeping for 10, a fully furnished kitchen, microwave, outdoor seating, fire pit, all sheets, quilts, and pillows, board games and 2 bikes. Please visit our website for more pictures and information: www.harbortownproperties.com. Or contact Brenda at 616-874-5297; 616-340-9256. Please contact the owner for prices and availability. This charming three bedroom home is just a short walk to downtown Grand Haven and the Chinook Pier, where you will find the musical fountain, marina, ice cream, great shopping, and the boardwalk! Bike to the State Park, or hop on the trolley at the Chinook Pier for a day at the beach. Fully furnished, sleeps eight. Please visit our websit at www.harbortownproperties.com for additional information and pictures, or contact Brenda at 616-874-5297 or 616-340-9256. Please contact the owner for prices and availability. No pates, No Smoking, Winter Rental Available, Waterfront/Water Access. Contact the Cottages on Silver Lake Today! 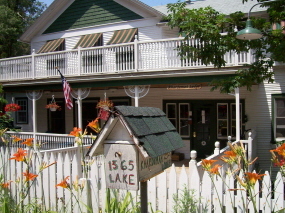 Beautiful cottage on Pigeon Lake, with 1/4 mile private Lake MI beach access. 3 Bedrooms, 2 full baths, full laundry, boat dock in front of cottage. Sleeps 6-8 maximum. 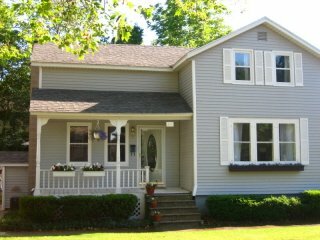 Completely refurbished, remodeled (just finished Oct 06) Located 1/2 between Holland and Grand Haven. $1550 per week with $250 refundable security deposit. 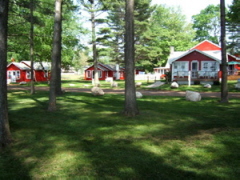 Historic Khardomah Lodge is the pefect "cottage" for a large family! Offering 15 cottage style guestrooms which share 4.5 baths, Khardomah has the ability to sleep 37 guests under one roof. Fully appointed kitchen with 2 refrigerators, dishwasher, stove and microwave, full dining room and double french doors to access 2 grills on an outdoor wrap around deck. Two additional Suites are also available to rent within the lodge. June, July, and August, Sunday to Sunday rental preferred. September 15 - May 15 a two night minimum is preferred. Khardomah is situated in a wooded setting, only a short 200 paces to the landing overlooking beautiful Lake Michigan, down the stairs, cross the road and wiggle your toes in perfect "singing sands" before reaching the waters edge! Great downtown location in one of Grand Haven’s most famous historic private homes. Completely renovated and furnished upstairs apartment in former servants quarters of the Edward P. Ferry Mansion. 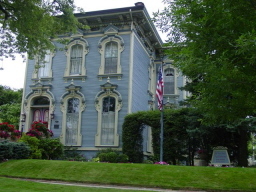 Renovated in gorgeous Victorian Style. Beautiful gardens with courtyard, gas grilling available, close to waterfront, boardwalk, shopping and trolley stops. One bedroom with queen-size bed, air-conditioning, private telephone. Kitchen complete with microwave, coffee maker (free coffee provided), etc. Color cable TV with VCR and DVD, computer with high-speed internet access. Living room sofa also converts to double bed. All linens, dishes, soap, kitchen utensils etc. furnished. Everything you need for a week or a weekend. Please, No Smoking or Pets. Double occupancy rate as follows: May-June $450/week; July-August $500/week; $225/weekend; $120 overnight. Available: year round; winter rates. Updated two bedroom cottage with open floor plan and large window walls to maximize the view of Lake Michigan. Over 75 feet of private sandy beach on the lake. All ammeneties (including washer and dryer) are included in this fully furnished cottage. Summer weekly rental rates from $2,200. Weekend off-season rentals $700 for 3 nights. Cottage also comes with numerous beach toys (including volley ball net). There are still a few weeks available for 2007. Summer weekly rental rates are $1,250.00. Coast Guard Festival Week $1,450. Weekly rental begins at 4PM Sunday and ends at 11AM the following Sunday. A 50% non-refundable deposit due upon reservation. Angeleri Cottage and Bungalows have been in our family for many years! We love to share them with other families and friends to share the majestic beauty and tranquility of the location. Our cozy home in Grand Haven has a front porch, private drive, plenty of shade and space for your family and guest parking. Parking is also allowed on the street. Located near central park and a few blocks from downtown. A pleasant walk to downtown, the broadwalk, musical fountain and much more. This newly renovated cottage features 2 bedrooms, a large kitchen/dining area, living room plus a finished downstairs. Sleeps up to 9 people. Amenities include: a fully furnished kitchen, washer and dryer, dishwasher, garbage disposal, microwave, coffee maker, toaster, tv/dvd player, stereo, sheets, blankets, pillows, and 3 bikes. Please visit our website for more pictures and information: www.rentgrandhaven.com or contact Kirk at 616-502-2720(cell). Please contact Kirk for prices and availability.